The actual speech text is here, delivered at 11am this moning. It is reviewed in The Times, in the Telegraph, the BBC, the New Statesman and elsewhere (140 reports and counting). Negotiations on a exit settlement should then proceed, using the “Norway option” as the base, involving joining EFTA and adopting the EEA agreement. Additionally, the entire EU body of law should be repatriated, to ensure legislative continuity, allowing for selective repeal and amendment as appropriate and necessary. The loss of influence in leaving the EU is more than made up for by the restoration of our standing in international organisations such as Codex, UNECE, OECD, and many others, where we would be negotiating in our own right, determining standards which, under WTO rules, the EU is obliged to adopt. In this, there would be no “fax democracy” as such. We would be sending laws down to Brussels – not the other way around. The issue of “freedom of movement” is dealt with by dropping out of the ECHR and the EU treaties, so that we would only be obliged to grant freedom to workers, and not their dependents unless we chose to do so – plus restoring the ability to deport illegal immigrants. However, Paterson reminds us that it took 40 years to progress to this stage of integration and we are not going to resolve all the issues in one stage. For the longer term, therefore, he argues that we would need to progress from the EEA to ensure a genuine Europe-wide Single Market, working on a truly intergovernmental basis. One possible alternative, he suggests, is to strengthen the regional UNECE, so that it can administer the Single Market as an economic project rather than a political construct. Using that body, we would be able to negotiating directly across the board, cutting out the EU as the middle man, and substantially enhance the transparency of the system. With a more durable European solution in place, we would be better able to promote our economic interests and we would also be able to take a lead in revitalising international trade. Free from the EU, says Paterson, we would have real influence on shaping the global regulatory models where true power lies. The UK would have a key role in building transparency with enormous benefits to tackling organised crime, such as human trafficking, addressing issues of migration constructively. In conclusion, Paterson adds, the Eurozone has already embarked upon a path that we can never follow. We are simply recognising that reality. We must either be fully committed to “Le Projet” or we must build an entirely new relationship. The British people must be allowed to make that decision. Article 50 is the best method of making this happen. By this means we would forge ahead and resume our rightful place as a global leader. With our own independent status, working closely with our many allies, we would massively increase our influence. As Churchill said, “We have our own dream and our own task. We are with Europe but not of it. We are linked but not comprised. We are interested and associated but not absorbed”. He was right then and he is right now. Get this message across and the UK has a spectacular future as a flourishing world power. 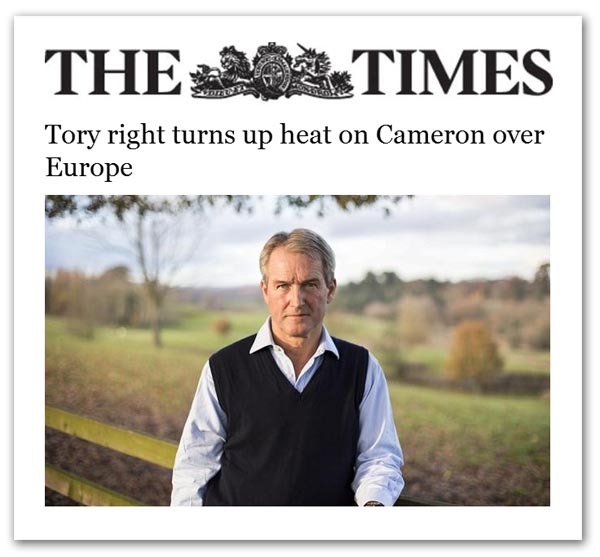 This entry was posted on 25/11/2014 at 01:29	and is filed under FleXcit, FleXcit Plan, Owen Paterson, Richard NORTH. You can follow any responses to this entry through the RSS 2.0 feed. You can leave a response, or trackback from your own site.